Although experimental television transmissions were conducted in Australia as far back as 1929, it was the 1940s before the government of the day considered the full scale introduction of television — and with a World War currently in progress, any further development was put on hold. Progress after the war was slow, but the upcoming 1956 Melbourne Olympic Games would ensure that TV would arrive in time for the Opening Ceremony — and it did, only just! Following public pressure, the Government appoints a Royal Commission into the introduction of television in Australia. The Royal Commission reports that television services should be introduced gradually – initially an ABC station and two commercial stations in each of Sydney and Melbourne with other areas to follow. The Australian Broadcasting Control Board conducts public hearings into the allocation of commercial television licences for Sydney and Melbourne. Consequently, the first commercial television licences issued to Herald and Weekly Times (Melbourne), General Television Corporation (Melbourne), Amalgamated Television Services (Sydney) and Television Corporation (Sydney). September 16: TCN9 Sydney becomes the first TV station to begin regular transmission. Station announcer John Godson introduces the station on-air at 7.00pm, then Bruce Gyngell introduces the first program, This Is Television. September 27: GTV9 Melbourne conducts its first program transmission with a one hour and 20 minute broadcast of cartoons and a John Wayne film from 4.30pm, hosted by Geoff Corke. From Monday 1 October the station commences daily test pattern transmission. October 27: TCN9 is officially opened. November 4: HSV7 Melbourne is officially opened. November 5: Opening night of the ‘national television service’ with the first ABC television station, ABN2 Sydney. ABV2, HSV7 and GTV9 (conducting test transmissions) televise the Melbourne Olympic Games. December 2: ATN7 Sydney is officially opened. The following day, ATN launches Australia’s first current affairs program At Seven On Seven with Howard Craven, and the first ‘tonight’ show, Sydney Tonight with Keith Walshe. 5% of Melbourne households and 1% of Sydney households own a TV set. March 2: Bob Dyer’s Pick-A-Box, a radio quiz since 1948, launches on ATN7/GTV9 and runs until 1971. April 20: The Victorian Football League (VFL) is televised for the first time, with Melbourne channels ABV2, HSV7 and GTV9 permitted to broadcast live coverage of the final quarter of league matches. May 6: GTV9 launches Graham Kennedy’s In Melbourne Tonight, a live variety program that lasted 13 years. TCN9 forms an affiliation with HSV7, and GTV9 lines up with ATN7. December: The first edition of TV Week goes on sale in Melbourne. June: ABC launches its own TV magazine, TV News, in Sydney. October 20: ATN7 launches Australia’s first TV ‘breakfast session’, including the first serial drama, Autumn Affair. November: TCN9 launches Brian Henderson’s Bandstand, a variety music program that launched the careers of many Australians. It lasts for 14 years on Nine. TV Week launches its own annual TV awards, initially known as the TV Week Awards but would later be named the TV Week Logie Awards, after television pioneer John Logie Baird, the following year. New TV stations: QTQ9 Brisbane, NWS9 Adelaide, TVW7 Perth, BTQ7 Brisbane, ABQ2 Brisbane, ADS7 Adelaide. January 9: Melbourne and Sydney are linked by microwave for the first time, enabling television programs to be screened simultaneously in both cities. August: ABC’s TV News-Times (formerly TV News) expands circulation with the launch of a Melbourne edition in competition with TV Week. HSV7’s weekly sports program World Of Sport begins on Saturday mornings. It soon moves to Sunday afternoons and continues every week for 28 years. 1957 April 20. Was it not the FIRST quarter telecast live, not the last. The VFL were afraid that showing the last quarter would greatly diminih attendance at the games. Hi Peter. I double checked and it was the Final Quarter. According to The Age at the time, on Saturday 20 April 1957, all 3 Melbourne channels were to broadcast the final quarter of the Collingwood v Essendon match starting at around 4.00pm. The channels were originally intended to broadcast a different game each but a last minute pay dispute led to them all covering the same game. You are absolutely correct Andrew. I see from my diary as a kid that on 31 August 1957 I watched the 4th quarter of the first semi-final with Carlton v Hawthorn. I have a feeling though that sometime later, next season, it was only the first quarter shown because of the concern for ground attendance. I have no record of this however. Great website by the way. Thankyou. Is there anywhere where I view the cartoon that opened GTV9 each day (guy runningthru the studio turning everything on) and a similar one at the end of transmission? There might be something of that footage on YouTube but I am not aware of any I’m afraid. Steve, ive wondered the same question myself.. Ive tried to find that cartoon but to no avail.. If i ever see it, i will be transported back to all those early saturday mornings when id get up to watch it.. The cartoon footage was used at the start of the late ’90 Melbourne series “Television: The Way We Were”, and again at the start of a “50 Years Of TV” DVD release via the Herald-Sun in 2006. That cartoon of man running and, turning on the power ect, was to lntroduce Phillip Brady’s morning show Mon-Friday, I’m sure this was the earliest breakfast show, it ran for an hour and, started at 6am. I’m sure Phillip could provide more info and,possibly the opening clip. I believe Sydney’s ATN7 was the first in Australia to launch a daily breakfast program, Today. But GTV9 in Melbourne did later launch its own program, also called Today. Does anyone know how long that first show, ‘This is Television’ was? I am trying to find out exactly what was telecast that first evening, 16/9/56, and also where people could watch it in Sydney as there were so few TV sets. Carol you are perfectly correct there were very few receivers, with the result that many people got their first taste of television by crowding around the windows of retail shops – yes they actually did that! Great to watch this on the ‘good old days’ when Bruce Gyngell was our boss. I worked at TCN untill 1968 on the office and record library – would love to hear from Telecine folk or anyone else. Television had wonderful dramas and variety shows like Bobby Limb,Don Lane, Ray Martin at Midday with ‘live’ studio audiences. I have extremely happy memories of my TCN days. I think it was the first live afternoon show? Unfortunately, as per the Contacts page, there is unlikely to be any surviving footage from shows of that vintage. The ability to archive programs then was limited and even if material was archived we don’t necessarily have compatible technology to be able to retrieve it. Copyright is another issue as well. Interesting to hear about you appearing on Thursday At One, though. What was your role in that program? You may have also read recently that host Binny Lum passed away at the age of 97. I have (from a very poor quality kine transfer) about twenty minutes of “Thursday At One” – only people in the segment I’ve got are Bert Newton, Laurel Young, Ernie Bourne, and Shirley Broadway. Very interested to hear about your comments regarding “Thursday At One” .I have very fond memories of that show as I was a member of a group called “The Hi-fi’s” and we were contracted to that show for a 13 week period to vocally introduce all the guests that were appearing each week. Godfrey Phillips was the director of the show and Phillip Brady the compare. I still have some of the scripts from the show. I don’t think videos of that show would be available, although I do remember that Godfrey did have some vision which he had at his TV memorabilty display down Frankston way. Sadly Godrey is no longer with us. I would love to see that footage- my aunt was Laurel Young – I also have some typed scripts – in those days the comperes had to do everything! she found it a bit too much so stepped down so her assistant Bert newton could take over the show! my dad is trying to find any clips from a show called The Youth Show. It showed in 1958 or 1959 he thinks. With Keith Walsh and Carol Finlayson. I am inquiring on the singer named Bill Mc Cormick, who appeared on early telivision. I’d also like some footage or info on The Coles 3000 Question Quiz. My dad, Eric Lysaght, was a champion for six weeks, eventually winning a cruise to London. “Lady For A Day” was based upon the US series “Queen For A Day”. It was hosted by Larry K. Nixon, with Graeme Bent, June Lansell, and John D’Arcy also featuring. It began in August 1960, and ran on HSV-7 until 1962. Hi my mum was one one of the dancers on the bobo show. Im trying to find anything that may have her in it as I have never seen any footage. Hi. Are you still looking for info and photos of Bobo the clown? I’m trying to find the name and footage of a morning show on channel 7 in the late 50’s or early 60’s I was modeling hats on the show but I was very young about 8 or 9 the hats had plates on them would love to show my children and grandchildren. Hi I am Joy Fountain’s daughter.. are you still wanting information? What is the earliest surviving recording of an Australian television variety series? 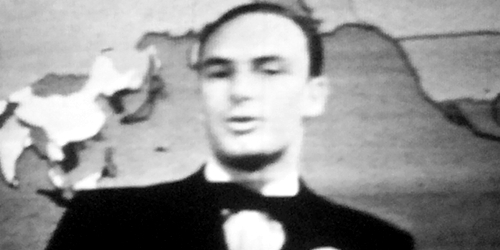 A possibility is the 11 April 1957 episode of “TV Channell” (with Douglas Channell), which appears to be held by the National Archives of Australia as a 16mm film print (a kinescope recording, to be exact). As for the earliest surviving recording of a locally-produced game show, well, National Film and Sound Archive lists the first episode of “Give it a Go” among their holdings (broadcast 25 February 1957). At the very least one of the earliest. Earliest surviving example of a locally-produced drama is more difficult. Some of ABC’s 1957 Sydney-produced TV plays were kinescoped so they could be shown in Melbourne, but I can’t determine if any of those kinescopes still exist. One 1958 live play that I know exists as a kinescope is “Murder Story”, set in England, with a cast including John Ewart. National Archives lists it as being from 20 May 1958. Incorrect. According to a newspaper TV listing it was actually broadcast 21 May 1958 in Sydney. The kinescope however wasn’t shown in Melbourne until 15 July 1958. It wasn’t unusual in 1958 for Sydney-produced ABC shows to take weeks before being shown in Melbourne. It worked both ways. A 19 October 1958 Melbourne-produced live play called “Last Call” wasn’t shown in Sydney (as a kinescope recording) until 4 January 1959! No idea if the kinescope still exists. Earliest surviving music broadcast? No idea at all. One that I do know of is “William Clauson Recital”, featuring US folk singer, held as a kinescope recording by the National Archives, it was originally broadcast on 19 September 1957. But a 1960s documentary included a very, VERY brief clip of “Campfire Favourites”, which ran during the last two months of 1956. Does the kinescope still exist? After doing some additional research, it appears that a 1957 ABC live television play called “Shadow of Doubt” (shown live in Sydney on 5 June 1957) may possibly exist as a kinescope recording held by the National Film and Sound Archive. That would certainly make it an early surviving example of Australian television drama, though admittedly it was an adaptation of a 1955 British stage play. Further information can be found on Wikipedia’s article on it. I am more interested though as to whether a kinescope still exists of another 1957 ABC television play, called “Ending It”, starring Bruce Beeby, Madi Hedd and Keith Buckley. I know for a fact that it was kinescoped, the question is whether the kinescope still exists. One of the main reasons it interests me is because it was a remake of a 1939 BBC TV one-off play. The very first ABC play, “Twelve-Pound Look” survives, minus sound. A very strong contender for this title would be Sydney’s TCN Channel 9’s Bandstand. The programmes were recorded on kinescope and are in Channel 9’s archives. I am chasing the origional footage for CINEMA SOUND – it has got a speed boat in the ad……. I was one of the child dancers in the childrens Saturday morning Show on QTQ9 Brisbane called Coca Cola Bottlers Club with the host Alan Brandt from 4BH in Brisbane. It was around 1959, 1960. I have a photo from the Christmas Show. Does anyone have photos or maybe film from this time??? Hello Cheryl, I was one of the little girls on the Coca Cola Bottlers Club around about the dates you mentioned. Sorry I do not have any photographs. I seem to remember your name. Did you attend Dawn and Robyn Piceathly (no idea of spelling) Dance Classes at Annerley, Brisbane? It’s rather sentimental isn’t it? Kind regards. Vaguely remember attending The ‘Hi Fi’ club which I think was associated with Coca Cola Bottlers Club 1959. they had a meet once at The Police Club Woolloongabba. Does anyone know how to access a news/sport article on hsv featuring the 1961 vfa grand final between Yarraville v Williamstown. This was also shown in 1984 when Yarraville folded. This year Williamstown fc are celebrating 150 years as a club and are having a hall of fame dinner. This footage could be used as part of the Williamstown fc highlights. The first commercial on Australian television was on Sunday 16th September 1956 on TCN Channel 9 Sydney. It was for Rothmans cigarettes. Hi was just wondering if anyone knew who the first news reader at GTV-9 was and which year did Eric Pearce take over? As I am sure that Eric Pearce began at HSV-7 first. Yes, Eric Pearce was initially at HSV7. I don’t know the timing of his shift to GTV9 I’m afraid but gather it was late 1950s. Well going by this site, I think Eric Pearce may have transferred when GTV was officially opened, and therefore was the first newsreader for both. But I could be wrong. Hi not sure if my last message was sent or not. Joy Fountain was my mother. I know only a year on since your request but happy to help. The well known ATN7 1950’s/60’S station close of the kangaroo putting the joey to bed is easy to come across, but their station opening of the same era seems to have disappeared. It was a traditional indigenous warrior approaching a cliff edge and throwing his boomerang which travels through the air and becomes an animated ATN7 logo. Has anyone seen it in recent times? I hope it has not “gone missing” because of political correctness. Glad to say this film survived and can be seen at 9.42 on “Channel 7: 40 years of Television” (YouTube). Robert Tudawali’s major achievement is always given as Jedda, though I think for many Sydney baby boomers he is much better recognised for opening Channel 7s daily transmission around mid-day for nearly ten years. it on the TV. That program was aired at around 4:30 PM in 1952 on CBC television and wecould not wait to come home to watch this program. When on these sites, they talk about old programs, I find it quite amusing when they talk of the sixties. I am talking the fifties, now that is old. I wonder if any old timers like me saw these programs. I am looking for an advertisement made during the 1950’s by Millers Transport or Millers Furniture located in Brunswick Victoria. it contains footage of my father Ronald Law and his friend. I have been to the Film archives and they callus only supply the details of Millers itself. But I desperately need the advertisement. Can you help. Or maybe tell wher I can go for assistance..
Hi Dianne. Sorry to say your chances are slim. Very little material of that era exists. Can anyone tell me the theme music for the midday movie intro…..think it was channel 7………… in the 50’s/60’s. Was classical music I think….. I remember the theme well Maree, but not the name. I will have to go through Youtube one day and find it. Your right, it was ATN7, and they used it from when the station opened until the late 60’s. Although the TV guides always listed it as Mid-day Movie, Channel 7 always advertised and referred to it as The Mid-day Matinee. Just remembered I’d put up this post….thank you for your response…I remember this song for some reason and was curious as to its name….and I do remember the “Matinee” being used well….. When was this timeline published? I need to use it for an essay. First published in 2000 but is constantly a work in progress as new information comes to hand. I was young at the time but remember it well because the intro scared the hell out of me. It was a woman walking along a footpath at night. As she disappeared into the fog she would let out a piercing scream. It was actually English and called “Hour of Mystery” and only made for one season 1957. Apparently it is lost and only two episodes still survive. I appeared on Many Tv programs on Early Melbourne Tv. On all channels,Has anyone got any film or Broadcasts. It would be great to Show the Grand kids. What was the name of the female newsreader on ABV2 (Melbourne) who read the 7PM news in the mid fifties. I would guess she was the first female newsreader on prime time OZ TV. wasnt the then Sie Donovan was it? Just wondering if there is any information regarding the contestants and winners of the Coles 3000 pound Question show. Muriel Flewell-Smith won in 1959/1960 with questions relating to Oscar award winning movies. Hi Carolyn. Unfortunately not aware of any resources with that level of information. I doubt much of it remains on file anywhere. You might have some luck contacting Channel 7 in Melbourne but I don’t know how you would go. Hi just wondering if it would be possible to find an story on Cobram Victoria. It was about a dog that could climb ladders. It was suppose to be the second ever documentary done on the ABC in around 1956-58. We have friends that can remember the day and have photos. I’m trying to find the name of a show which was broadcast late 50’s early 60’s. I think it went for 30 minutes and my recollection was that there was only one singer with a guitar, and always the same singer. He sang very croony songs and there was always a bevy of very nicely done up Bobby Soxers gazing up at him. Very close to the singer and on the same level. Hi Helen, do you recall which city or channel this was from? Was it an Australian show or from elsewhere? I think you mean the Mickey Mouse Club. We were the first on our street to have a television set in Seven Hills, Sydney. The neighbourhood children came after school to watch for an hour or two. Does anyone know when the Movie “Gullivers’ Travels” was aired? It was in the early evening I’m guessing about 1957/ 1958. My parents got me out of bed so I could see it. It made a great impression on me at the time! From The Sydney Morning Herald, p. 15 Monday 13 April 1959. THE first full-length cartoon feature to be shown on local TV will be presented tonight at 7.30 by ATN 7 It is “Gulliver’s Travels”, a free adaptation of Jonathan Swift’s satire, and is the first of two feature-length cartoons purchased for TV by ATN 7. The other—”Mr Bug Goes To Town”—will be screened later this year. Does anyone have information/photos regarding Leslie Gotto when she appeared on the show ‘Thursday At One’ interviewing local and international guests? Does anyone know the name of the attractive singer who appeared on either “In melbourne tonight” or one of its rival shows during the late 50’s.her stage name was something like Palita or similar. I have a photo of her but the name escapes me. if you are still looking for the answer, send me the photo and I will get the answer for you. Do you have any qualifications that make your information super reliable? I’m trying to reference some of this for an assignment and I don’t have much info. Information on this website comes from a variety of sources. Blog posts mostly include citations where applicable. particularly with Allan Stewart (The Great White Hunter of Darwin). He appeared in several segments. Hi about 1959 there was a documentary filming on preschools around Sydney and there was some filming at the Erskinville Preschool in Prospect Street that I was attending at the time , is it at all possible to get a copy of the documentary. can anyone help where I can follow this up? Unlikely that you would be able to obtain a copy. Please refer to this page. I also debated on the program against Heidelberg High. Niall Brennan (spelling ?). I was in the Geelong High team. Probably not much help ? I don’t know the answer but if you browse the Classic TV Guides section or enter The Lone Ranger into the search bar at the top of the page, there might be some mentions of the program.